The week is coming to an end (again), which also mean October is almost over. Another month is gone...it can be quite scary sometimes to think how time goes by so fast. Age must be really catching up on me...else why the constant nag about time?! Geeze! But I always tell myself, so long as I seize the day, it's good enough for me. FYI, my definition of seizing the day can be as small as baking a delicious cake, helped my daughter learn something new or even finish reading a book. Insignificant accomplishments? Not at all. Think of it this way...life is not about completing how many tasks but how you learn and grow from the task you completed. ;) So pace yourself ...live a little...cook something nice today perhaps? Hahaha! Enough time and life philosophy. :) What's cooking?! 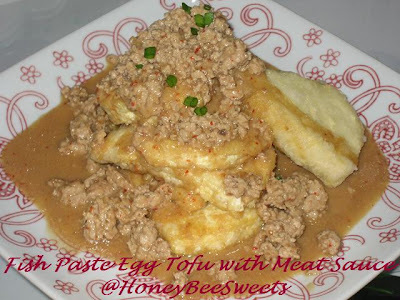 Today I am trying out another new "homey" dish, Fish Paste, Egg Tofu with meat sauce. This recipe was extracted from yet another new cookbook I acquired today: Chef Phang's Popular Signature Dishes, AKA “彭师博精典招牌菜". :) I have halved the recipe because I am only making it for my small family. So feel free to double it if you have a bigger group to serve. 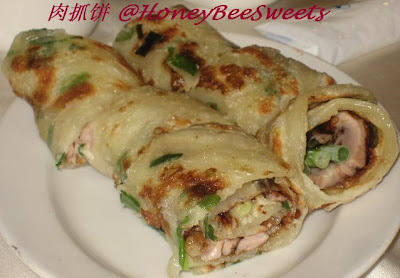 Put fish paste, soft bean curd, egg in a mixing bowl and mix well. Pour the mixture into a steaming tray and steam at high heat for 10 minutes or till cooked. Remove and leave to cool before cutting into pieces. 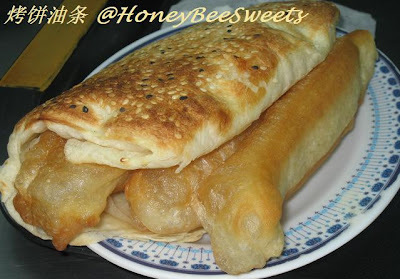 Coat the egg tofu with cornflour and deep fry in hot oil until golden brown. Dish and drain. Arrange into serving platter. Leave 1 tbsp of oil in the wok, saute the chopped garlic until aromatic. Add in minced meat and fry till almost cooked. Add seasoning and bring to a boil. Thicken with cornstarch water. 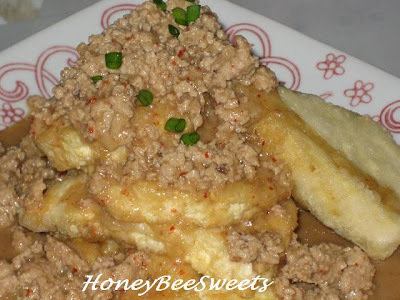 Pour minced meat gravy over fried egg tofu and serve with steam rice. Get ready a big bowl and place all ingredients in Set A and mix well. Set aside for now. Line & grease a square baking tray of 23cm by 23cm with parchment paper. Preheat the oven to 180°C. In a pot, melt the butter, brown sugar together till all melted and combined. Add corn syrup / honey to the mixture and stir well. Add the mixture of Set A into the butter mixture and stir well to combine. Pour the mixture into the prepared baking tray and press the mixture down tightly with the base of a cup. 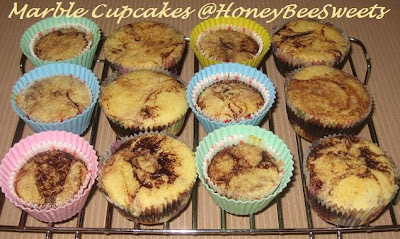 Bake in the oven for 25 to 35 minutes, until mixture is golden brown. Remove from oven and let cool before slicing it into bars. Chill the bars in the refridgerator till firm and store in airtight containers. 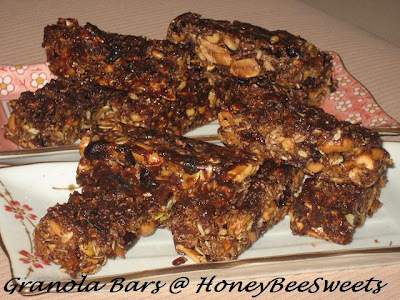 The sugar butter coating around the bar has crystallized after the baking and cooling, so it's like biting into a toffee bar! Sweet! 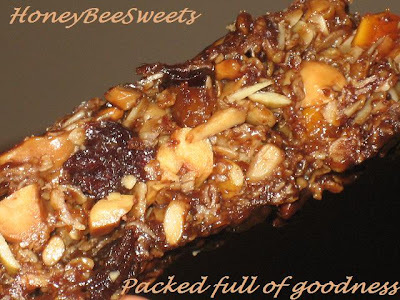 It's not too sweet and the texture is both chewy and crunchy, very satisfying. ;) Definitely a meal on the go! Well, perhaps not really a meal...a treat perhaps. Last item on my list today is Durian Butter Cake with Durian Cream. The story begins when my dear husband went to buy too much durian and we can't finish it! So I suggested to him that I will transform it into some bake goods that he can enjoy as well. So yesterday evening, I finally got to work and ....vola! Combined whipped cream and duiran puree together and chill in fridge till ready to pipe onto cooled cake. Grease a cake mould (I used 9" round pan) and line with parchment paper and grease again. Set aside. Preheat oven to 170°C. 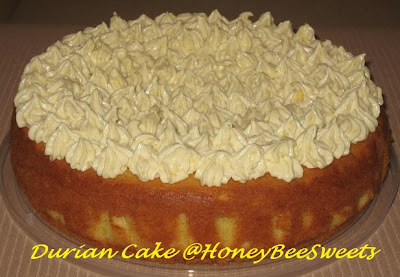 Beat margarine, butter, sugar till light and fluffy. Add in eggs, one at a time, beating thoroughly after each addition. Stir in durian flesh and essence if using. 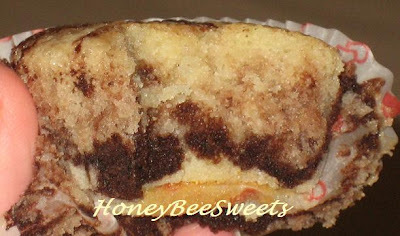 Fold in sifted flour, coconut powder, baking powder and soda. Mix well till combined. Pour batter into prepared pan and bake for 50 to 60 minutes or till golden brown and tester comes out clean. Let cool on rack completely and pipe durian cream over the top. Serve chill or room temperature. Enjoy! This is really a decant rich cake. Both buttery and durian richness...simply quite heavenly if you ask me, hahaha! ;D One bite and you are hooked, heehee. :) But....yes, there's a but. I did not realize I have slightly under baked the cake in the center....*sigh*. I did test it the cake with a toothpick and it came out clean....very strange! Anyway, it might also be the thick lumpy durian puree I added in that made it harder to bake through the middle. Nevertheless, minus the small middle section, the cake was still yummy good. ;) So good with a cup of hot tea. So before you guys "doze off" from my long post...I shall sign off from here. Have a super duper great weekend ahead guys! Yes, I'm slagging again. Have not been baking as much as I hope to lately. Can't really blame it on anything...somethings baking needs mood to do it. Lacking the mood? Yeah, perhaps. It almost sounds like I'm falling out of love, hahaha! Nah, ....I don't think I will give up cooking / baking ever. Anyway, I hope I'm not disappointing some of my regular readers / followers out there. For today, let's do something "homey", something simple, something that you can whip up anything time of the day without having to toil over it. 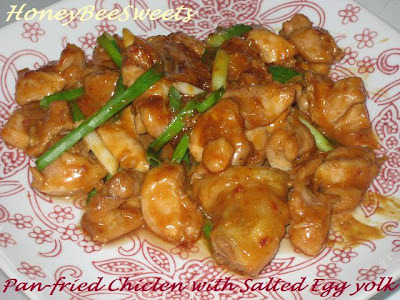 First up is Pan-Fried Chicken with Salted Egg yolk, or 咸香煎焗鸡. Yes, another delicious recipe from "大牌檔菜" Book 17. You can very well save your money from buying this book and just get the good recipes from my blog, hahaha! 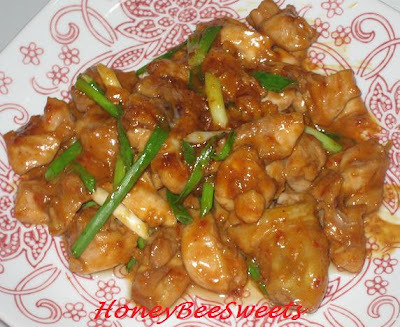 Mix chicken pieces with marinate and let season for at least 30 minutes. Heat up oil, stir fry the salted egg yolks until fragrant. Add chilli, chicken and stir well. Pour in water and stir fry until the sauce as thicken and the chicken is cooked through. Add in the spring onions and stir well. Dish up and serve with steam rice. YUM! Preheat the oven to 180°C. Line standard muffin tins with paper liners. Sift together cake flour, baking powder and salt. Combine milk and cream. Using an electric mixer, cream butter and sugar together till light and fluffy. Add one egg at a time beating until each is incorporated. Add in vanilla. Add in flour mixture in 3 batches, alternating with 2 additions of milk mixture, and beating till combined. To make the chocolate batter, measure out 1 cup of the batter, and transfer to another bowl. Combine cocoa powder with boiling water in a small bowl and stir into the 1 cup batter. 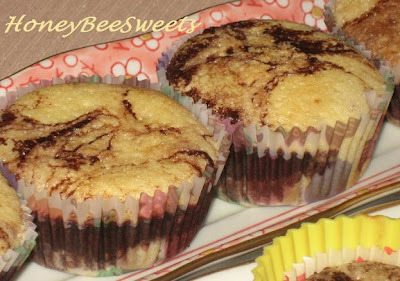 Filled the prepared cupcake liners with alternating spoonfuls of vanilla and chocolate batter, filling each 3 quarters full. 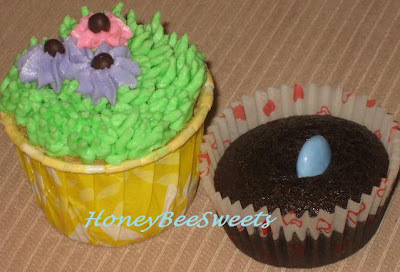 Run the tip of a toothpick through the batter to create swirls. Bake, rotating the tin half way through until tops are golden brown and the tester comes out clean, about 20 mins. Remove from oven and let cool on rack. To finish, dust with confectioner's sugar just before serving. This cake is strangely addictive! And with the suggestion of my friend, chilling it in the fridge makes it even better...YUM! 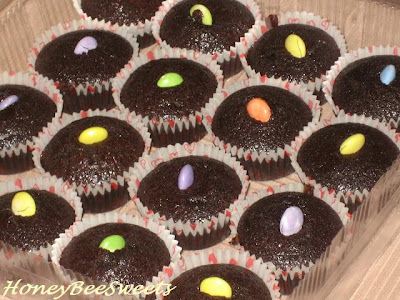 Definitely a simple and yet delicious treat to make for your family and kids on a lazy weekend. Do try and let me know how you like it. Cheers! Let's go GREEN today! No, not talking about Earth day. If you know me well, you know half the time I'm referring to food, hahaha. I'm talking about Pandan, yes pandan leaves, A.K.A. screwpine leaves as some will call it. It's fragrant and very commonly used in South-east Asia, especially in Nonya dishes. Not only for cooking purposes, people uses it in ways like repelling bugs and undesired smells in enclosed areas. I remember years ago, whenever I take a taxi in Singapore, inside the cab will always have a bunch of pandan leaves at the back of the rear window area! True story! So anyway, when I was at the wet market over the weekend, I bought 2 big bunches of pandan leaves, which only cost me Rm0.70...so cheap! I remember I had to pay like USD$2 for 5 small sticky leaves in California! So, in order to make full use of the cheap pricing & abundance of this fragrant and versatile leave/herb, I cooked 2 easy and delicious dishes to share with everyone. Mix chicken with marinate and let it season for at least 1hr. 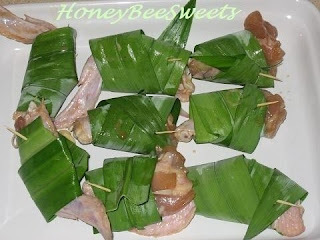 Tie the chicken pieces with pandan leaves and secure it with bamboo sticks/ toothpicks. Heat up the oil and deep fry the chicken till golden brown. Dish up and drain oil on paper towels. Serve while still warm. 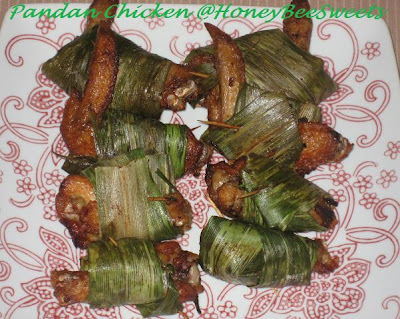 As you can see, I did not really do a good job wrapping the pandan leaves around the chicken pieces. But luckily it did not fall off while it was been fried. Have to tell you the whole house smell soooo good while it was frying up in the kitchen....yummy! The chicken was tender and flavorful with an evident pandan aroma...delish! 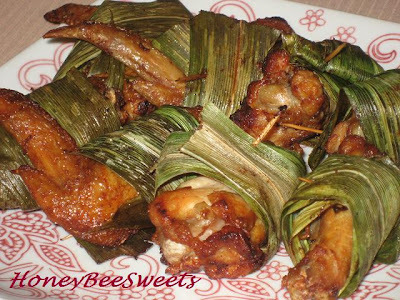 Shall try making it with deboned chicken thigh next time...so I can pop the whole meat in my mouth, something like a h'orderves. ;) Definitely a keeper....do try it when you can find fresh pandan leaves in the market. 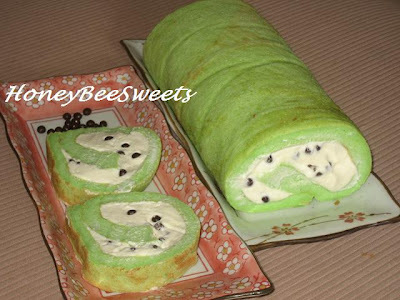 Next up is desert, Pandan Coconut Swiss Roll. Whenever I want a nice piece of fluffy soft cake with some delicious filling...swiss rolls always does it. It's simple to make, much lesser time and trouble to prepare. And since I am on the "pandan theme" today, I decided to make pandan cake! In a large heat proof bowl, microwave the butter till it all melts, about 1 minute on high. Add flour into melted butter and whisk to form thick paste. Add the egg yolks and stir to combine. Add pandan juice, coconut milk and green food coloring and stir again. Preheat oven to 180°C. Butter a baking tray of about 10cm by 14cm. Line with parchment paper and butter the top of the parchment paper. Beat egg whites with salt until foamy. Continue to beat the egg whites and slowly add the sugar to it. Beat till mixture is stiff peaks. Gently fold in the egg whites to the flour mixture in 3 portions. Making sure most of the white is not visible after folding. Pour cake batter into prepared tray and bake at 180°C for 15 mins. Then lower the temperature to 170°C and bake for another 5 mins. When done, remove cake from oven and immediately remove from baking tray. Let cool on rack for 5 mins. Then using another parchment or clean kitchen towel, flip the cake over and peel off the parchment paper. Continue to let cool for another 15 minutes. In the meantime, prepare the filling. Whipped the cream with the confectioner's sugar and vanilla extract till firm peaks. Spread the whipping cream on the cooled cake and sprinkle the sweetened red beans or valrohna chocolate balls on the cream. 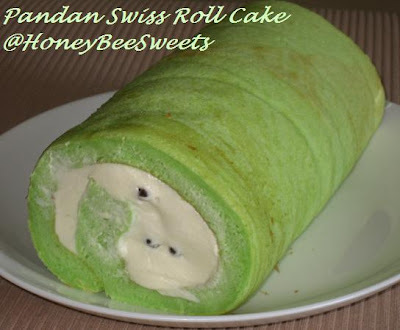 So go green today, try out these pandan recipes...you'll love it! Happy cooking! Even though it was Deepavli holiday yesterday, I still did not get much of a chance to rest. Let me elaborate. Since my girls were home with me yesterday, I decided give them a treat and cook up a batch of Banana Chocolate Chip Pancakes for our breakfast. 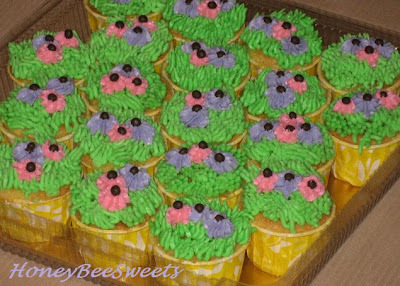 It has been awhile since I made these, so my girls enjoyed it very much. :) After breakfast, I immediately got to work on tomorrow's breakfast! Haha..talk about efficiency! 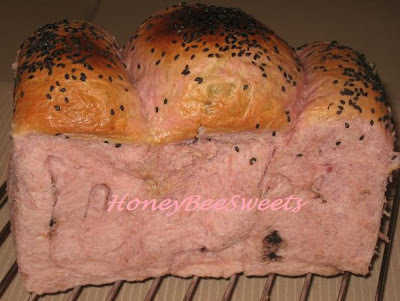 This time I decided to twist my old recipe and come up with a new one; Purple Sweet Potato Oat loaf with Black Sesame. Sounds complicated but not so. 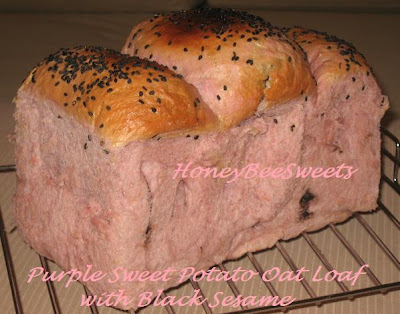 I simply used the original purple sweet potato milk loaf recipe and added oats to it. If you have tried baking my Oat loaf before, you should know what I mean by that. 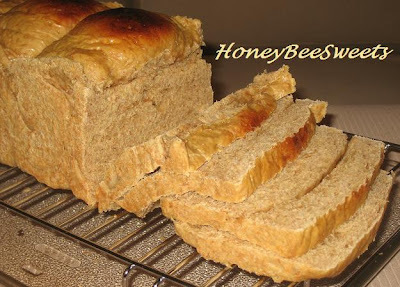 I will post the recipe for this bread minus the steps as it is very much the same as the original purple sweet potato milk loaf. This is paste is creamy and has a nutty taste and slight sweetness to it....almost like peanut butter...but "toastier"....yummy! Interested...try finding it in those international grocers...good luck! 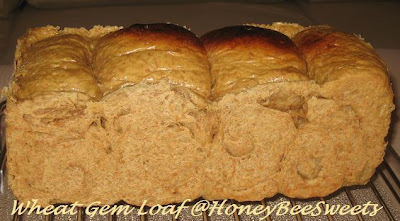 But again, any spread of your choice would still be a good compliment to this yummy loaf, no problem at all. 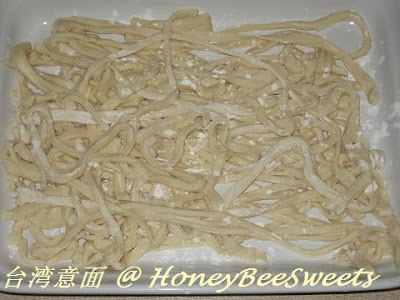 The other challenge I took up yesterday was to make Za-jiang Mian (炸酱台湾意面). Yeah, sounds crazy right! Have been craving for a bowl of that noodle since I came back from Taipei. And to think that I actually hunt for a good Taiwanese cookbook while I was there so that I can try to replicate the dish at home when I return, haha! And you guessed it, making it was definitely harder then I thought!! The noodles turned out slightly tougher then expected. Perhaps I over kneaded it? Or have I added too much cornflour while trying to separate the noodles. Maybe I did not slice the noodles thin enough. 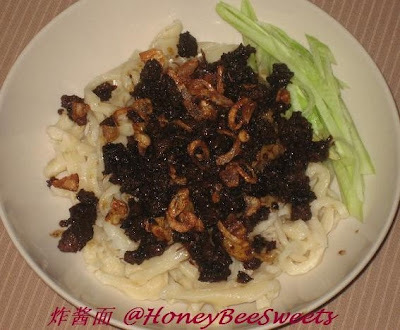 :-P Anyway, in the recipe book, the name for the noodle is called 台湾意面. Dissolove the salt in the cold water. Add beaten egg to water, and set aside. Sift all flours into a big mixing bowl. Make a well in the center and add the liquid mixture. Mix everything together till it forms a soft dough. Keep kneading till it is smooth and not sticky. Let rest for 20 minutes covered. Roll out dough into 2 to 3 mm thick and 30 cm long. Sprinkle some cornflour on the dough to prevent sticking. Fold the dough into a letter form and slice using kitchen knife into thin strips. 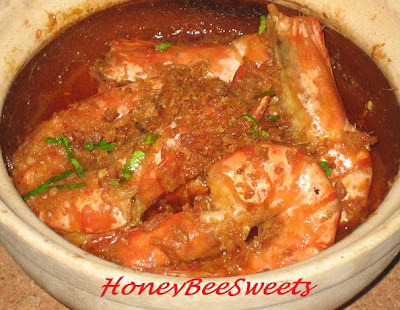 In the work, using the2 tbsp of the oil used for frying the shallots and cook the minced dried shrimps till fragrant. 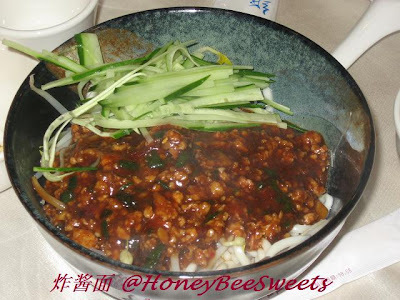 Add minced pork and cooked till almost done. Add five spice powder, pepper, light and dark soy and stir well. Add 2 small cup of water and cover to cook at low fire for 15 to 20 minutes. Meanwhile, set a pot of water to boil and cook the noodles till it just float up. Drain and dish into bowls. Place some sliced Japanese cucumber on the side. Uncover, add salt, sugar and chicken powder seasoning. Stir well and add the fried shallots in, remove from fire. Spoon some meat sauce over the noodles and serve while hot. The meat sauce turned out to be very good! I just wished I have done a better job with the noodles! :-P But it was still yummy overall, a satisfactory dinner for the family. :D But I am still thinking of restaurants serving up those delicious handmade noodles...so good! I wonder where did I go wrong?! Will work on this recipe again and hopefully I can come up with spome new tricks to make the noodles more delicious. Perhaps the next time I should just stand at those glass window display @ the Chinese restaurants where the chefs make the noodles in front of everyone and watch the expert at work, hahaha! ;) Until next time my friend...have a good one! It's been a year. Yes, 365 days since I last started this food blog. Wow, time sure swoosh by amazingly fast. If you noticed, the counter on the left top corner, is the number of days I have been blogging. That comes to the same day which I celebrate the birth of my 2nd child. I still remember clearly that day I was toiling away making her an "A" shaped birthday cake last year. Almost feels like yesterday! After seeing her sister's birthday cake a few months back, my 2nd daughter has requested me for the "impossible". So I kind of promised my little girl without thinking deep into it. Yes, a princess cake...don't they all want that nowadays? My girl happens to fancy Princess Snow White more then the others. However, making this cake has really put me to the test! That kind of explained why I was missing in action lately. 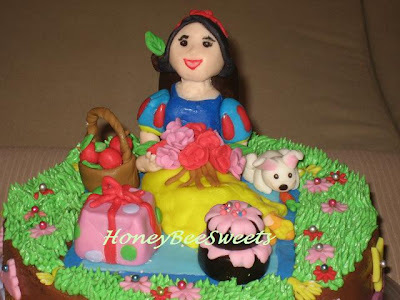 I used up all my energy and time to come up with the best Snow White Cake I can....Anyway, Happy Birthday Arissa! Okay, I admit, there is definitely room for improvement. But I was kind of pressing for time towards the end, and I have over estimated the "stability" of my fondant mould. :-P So there was a lot of last minute patching when I started to assemble the cake. Good thing it was completed in time and everything stayed the way it suppose to be, hahaha! But most importantly, my daughter was absolutely thrilled when she saw the completed cake. She was so happy that for a few moments I caught her mesmerizing looking at the cake, haha! Guess I did my job. 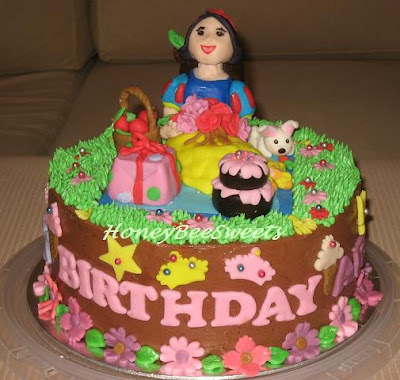 ;) Not realizing what I have got myself into....my elder daughter came to me after seeing the Snow White Cake and said "Ma, I want a Cinderella cake on my next birthday." !!! :-P Deeper and deeper I go... geranimo!!! 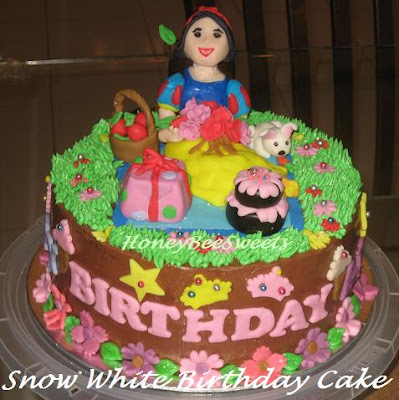 Just in case you are wondering, Snow White is leaning on a chopped tree trunk. Well, if you have played with fondant before, you should know that it has no "backbone"...literally, hahaha. So moulding a standing or siting figuring can be tricky. I figured Snow White is pretty close to Nature....a tree trunk would be prefect. 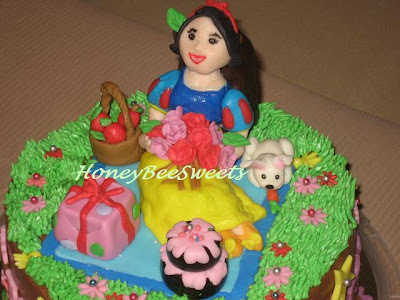 I wished I had done a better job moulding the princess face...it is so not Snow White looks, hahaha! But it is my 3rd attempt and it was the best I could come up with...*sigh* And that rabbit on the right...yeah, it's not a dog! It's a fluffy white bunny. :-P I guess I really need to practice more! There will not be any recipe posted today as there is quite a bit to cover. (and it's almost 2am now!) 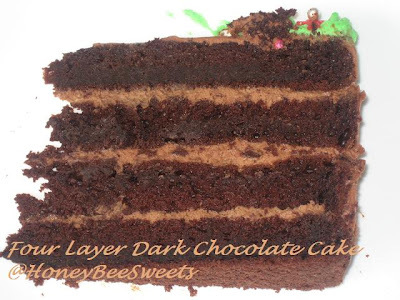 But I did used similar chocolate cake recipe that I made for my husband's birthday cake. In that I replaced the sour cream with cream cheese instead....plus a few adjustments here and there. Final Thoughts: Being able to complete this challenging cake on my own at this point in time (1 year) is like reaching a milestone for me. As any food blogger out there; baking and blogging was one thing I truly enjoy tremendously. It's through these small achievements of cooking or baking something delicious, sharing it with my love ones and posting it for everyone to enjoy; that I find the joy in it all. I just wish this wonderful thing I found can still continue even as the coming challenge of life changing plans we have laid out in the coming months. Wish me luck dear friends...I need loads. ;) Cheers! Deep-fry the prawns in hot oil for 1/2 min. Dish and drain. Leave 2 tbsp of oil in the wok, saute grounded spice until fragrant. Add coconut milk, water and continue to cook for 2 minutes until the sauce has thickened. Add fried prawns, seasoning and stir well. Dish onto a serving platter. Sprinkle deep fried dried shrimps and kaffir lime leaf on top and serve. This is yet another wonderful dish to serve with steamed white or basmati rice. 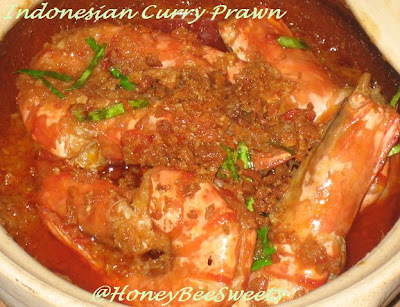 I can eat a big bowl of steamed rice with this yummy gravy and sweet prawns, so I always cook extra rice whenever I make curry dishes...mmmm! Made some bread again today, specifically a varieties of buns. 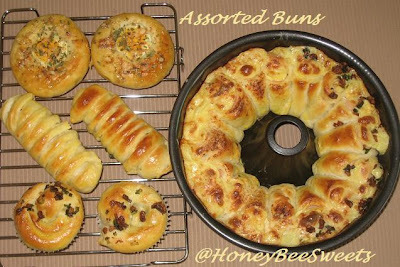 Have been planning to do this since last week, since my better half totally enjoyed the buns I made before. ;) Besides the usual ham and cheese, hotdog buns, I made a couple of new ones; (1)Fried Shallots and Scallions (green onion) Buns, (2)Egg and Mayo buns. 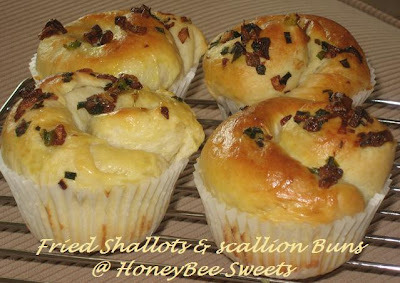 The fried shallots and scallions filling is pretty easy to prepare. Simply fry the sliced shallots till golden brown, drain off majority of the oil, then add the chopped scallions, a dash of pepper and salt to taste. Stir fry for another 15 seconds and dish up to cool before use. Hello again everyone! It's good to be back again! Have been away for a few days in case any of you out there is wondering what happened to HBS. Yeah, I just got back from a short vacation to Taiwan, Taipei to be specific. 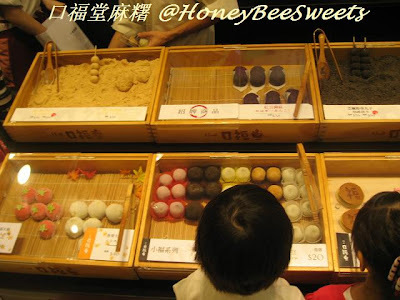 Want to share with you what I did in Taiwan in this post. Hope I don't get too long-winded though, so bare with me a little & hear me out. Have been wanting to visit Taiwan for quite some time, so this was truly a wish come true. ;) Overall, it was a great trip! Lot's of fun, food and also meeting up some good old friends there. To cut the story short, I shall only highlight some of the interesting things we did there. 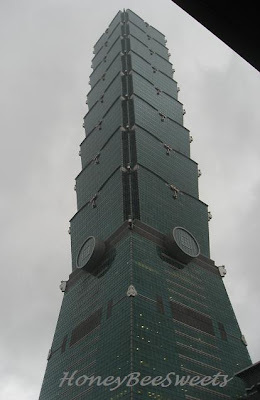 First, of all, we managed to visit some of the major places, and one of them is 台北101大樓 or famously known as Taipei 101 which is one of the tallest building in the world. 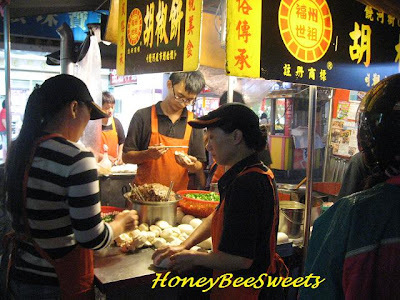 To experience their famous night markets (夜市), we went to both RaoHe (饒河街觀光夜市) & Shilin Night Market (士林夜市). Even though it was drizzling, the market was still going on and it was still packed full of people, eating and shopping...very "happening"!! 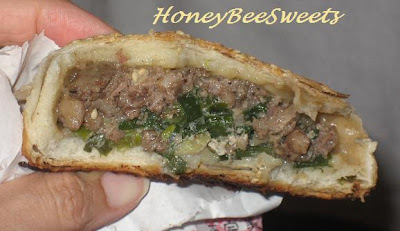 There are 2 street foods that I particularly like is their 胡椒饼 (pepper buns) and their o-a-mi-sua, or Ah-Zhong Mian Xian (阿宗麵線). Unlike the ones sold locally, they served it with basil & pork intestine, very good! You know I had so much delicious food in Taipei that it's kind of hard to tell you all all about it at one go. So I decided to show just a few of the snap shots for your viewing pleasure, heehee. 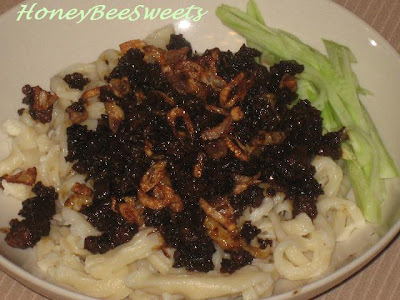 ;D Za-jiang Mian (炸酱面)...another simple yet mouth watering noodle dish. 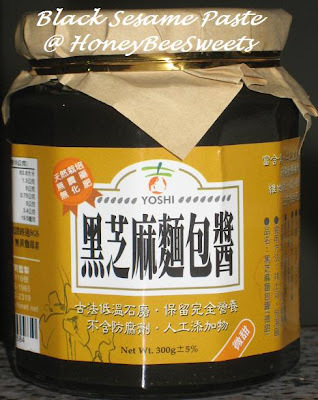 口福堂麻糬, best Muchi I've tasted! My girls waiting for theirs. They had banana green bean and peanut flavor while I had chestnut (栗子) flavor, yummy! 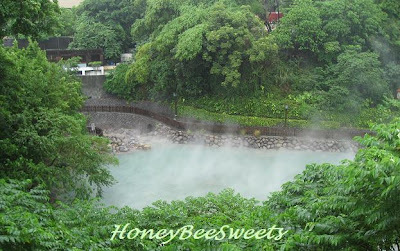 The day before we left Taipei, we traveled up to Xin Beitou hot springs (北投溫泉親水公園). Beitou is the most mountainous and highest of Taipei's districts, it is very easily accessible using the public train service (like Singapore MRT). I managed to get a shot of a river of sulfuric fumes from the hot springs while we were driving up the moutains to our hotel. We booked a private suite in 春天酒店 for 2 hours to soak ourselves in the hot spring to wind down and relax....very "siok"! And after that we got to dine at this nice Japanese restaurant which left us totally satisfied. Seriously...5 days 4 nights wasn't enough, wished that we could have stayed longer. But it was a wonbderful trip and I am already looking forward to experience more of Taiwan the next time we return. Come to think of it, we even get to experience earthquake and typhoon too, hahah! Thank god we were in Taipei, so we were safe. All we experience were a few seconds of jolting and drizzing. It doesn't look that bad in the picture....but I swear it was at least 2 inches taller then this. :-P Good thing it was still soft but just slightly more dense at the bottom. 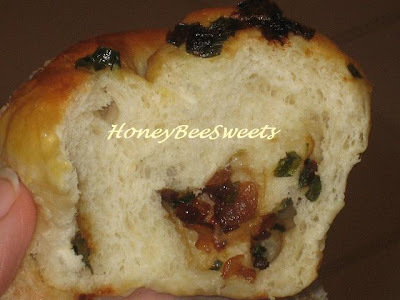 The slight sweet taste from the wheat flour and wheat gem is really nice. This time round I used Billington's Natural Molasses Sugar, so the loaf yields a deep mellow scent but not overpowering at all. As I mentioned before, unrefined sugar contains more useful minerals then processed white sugar. So I always try to use unrefined cane sugar whenever possible. 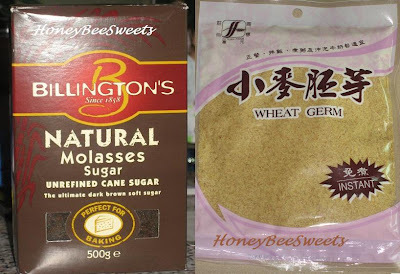 Besides that, the wheat gem I used was from Taiwan. Yeah, I know, you can get wheat gem here...but not my local bakery store for sure. :-P Due to the length of this post, I will not be posting the recipe this time. 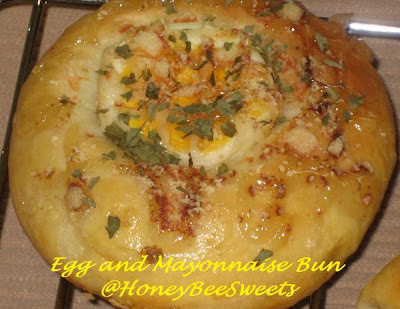 Will probably bake it again but with slight changes to it. 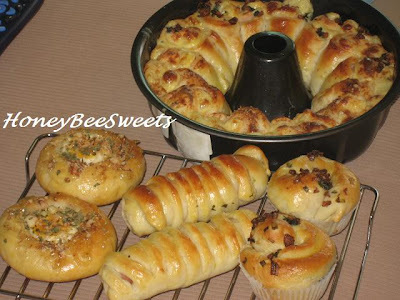 Interested bakers please go ahead to try this recipe first. Both was delicious and glad that my girls liked them. *Phew* I am so glad that I finally got through this post and I'm sure you do too, hahaha! Hope you had fun reading it as much as I had enjoyed writing it down for you all. Till next time, have a great one!